Built for power and speed, the 2018 Dodge Challenger SRT Demon boasts incredible highlights, including the title of World's Fastest Production Car. From a supercharged V8 with a variety of upgrades to a production-car first TransBrake system, the SRT Demon is fully-equipped to perform and take its place among top sports cars. What kind of driving power does the 2018 Challenger SRT Demon offer? Central to the Demon's powertrain is a supercharged HEMI 6.2-liter V8 engine, rated at 840 horsepower and 770 lb-ft of torque. 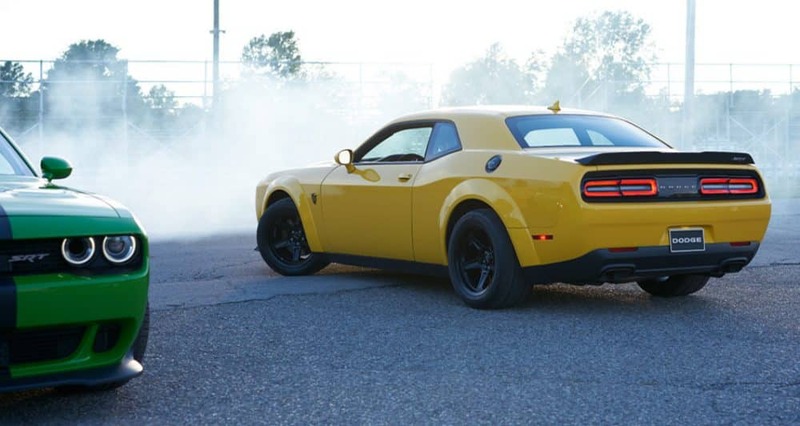 Built with the architecture of the Challenger Hellcat's V8, the Demon engine has 25 major component upgrades, including increased boost pressure (to 14.5psi), a higher rpm limit (6,500), and a larger, 2.7 liter supercharger. Every element of the Demon is built for speed. With the largest functional hood scoop in the industry, the Demon optimizes power output without sacrificing durability or throttle response. Able to run on 100+ unleaded high-octane fuel, the SRT Demon is also the first-ever, street-legal factory-production car designed to do so. The vehicle can also run on a mix of 100+ octane and premium unleaded fuels. What kind of accomplishments and highlights does the Challenger SRT Demon have? The 2018 SRT Demon boasts a wide variety of highlights and records, including the world's fastest 0-60 acceleration at a mere 2.3 seconds. The Demon has been noted by the Guinness Book of World Records for the first ever front-wheel lift in a production car, and is the first-ever factory-production car to be designed to run on 100+high-octane fuel, to be equipped with a TransBrake system and Torque Reserve, and to have the option to remove the front passenger seat for decreased weight. In addition to its many accolades, the 2018 SRT Demon stands out in being banned by the NHRA for being too fast for the drag strip. Able to travel ¼-mile in 9.65 seconds, this Challenger has the fastest quarter mile speed in the world. What are the exterior and interior design features of the SRT Demon? In addition to its superior speeds, the 2018 Challenger SRT Demon has an aggressive, sporty exterior design and a sleek, driver-centric and customizable cockpit. Wide body sweeping fender flares give the vehicle a sturdy, muscular stance, and 15 available exterior colors include Octane Red, Pitch Black, Go Mango, and Yellow Jacket. The Demon's exterior is further enhanced by an Air-Grabber hood scoop, dual Demon logos, and standard Nitto NT05R street-legal, drag-race tires. On the interior, buyers can choose between driver seat only, driver and front passenger seats, and two-row seating, in premium cloth or Laguna leather and Alcantara suede upholstery. A flat-bottom performance steering wheel, 8.4-inch touchscreen interface, and a white-face instrument gauge with a 200-mph speedometer round out the Demon's interior. Combining a wide array of production-car firsts with tried-and-true Dodge engineering, the 2018 Challenger SRT Demon creates a top-notch sports car experience. Deemed too fast for the drag strip, the Demon is a speed-machine with a high-performance powertrain and a sporty, aggressive exterior. For those on the hunt for race-worthy speed, the 2018 Dodge Challenger SRT Demon is the place to look.